Home > Rare and Unique, Specimens > Specimen Stocks, Bonds and Documents > Beech-Nut Life Savers, Inc.
Home > Health Care, Food, Beer, Retail, Tobacco > Food, Beer and Beverage A-I > Beech-Nut Life Savers, Inc. 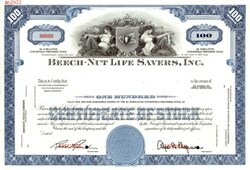 Beautifully engraved specimen certificate from the Beech-Nut Life Savers, Inc. . This historic document was printed by the American Banknote Company and has an ornate border around it with a vignette of allegorical women. This item has the printed signatures of the Company's officers. After registering the trademark, Crane sold the rights to his Pep-O-Mint peppermint candy to Edward John Noble for $2,900. Instead of using cardboard rolls, which were not very successful, Noble created tin-foil wrappers to keep the mints fresh. Noble founded the Life Savers and Candy Company in 1913 and significantly expanded the market for the product by installing Life Savers displays next to the cash registers of restaurants and grocery stores. He also encouraged the owners of the establishments to always give customers a nickel in their change to encourage sales of the $0.05 cent Life Savers. The slogan "Still only 5 cents" became a favorite treat for children with a tight allowance. Since then, many different flavors of Life Savers have been produced. The five-flavor roll first appeared in 1935. In 1956, Life Savers Limited merged with Beech-Nut.